We are pleased to announce the arrival of a new data set to the CyArk Archive. 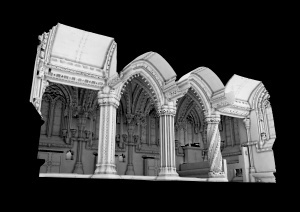 Working with Historic Scotland, the Digital Design Studio at the Glasgow School of Art, and the Rosslyn Chapel Trust, CyArk will be disseminating 3D data of the chapel collected as part of a digital documentation project. Although the chapel gained notoriety with the general public through its appearance in Dan Brown's The Da Vinci Code, the chapel has long been revered and admired by architects and historians. It is considered to be one of the finest architectural structures in Scotland. Dedicated in 1450, construction on the chapel began in 1456. The chapel is most famous for its intricate carvings found throughout the building and on its 14 pillars, the most famous being the Apprentice Pillar. The intricate stone carvings have many conservation challenges however, and conservation work at the chapel dates back to 1950. Moisture in the stones has created problems with cyanobacteria and in 1997 a shelter was erected over the roof of the chapel to allow the stones to dry out naturally. The Rosslyn Chapel Trust continues to preserve the monument and in early 2009 a digital documentation project began to accurately record the existing structure. Teams from Historic Scotland and Digital Design Studio at the Glasgow School of Art used multiple 3D laser scanners and high definition cameras to capture the interior and exterior of the famous chapel. 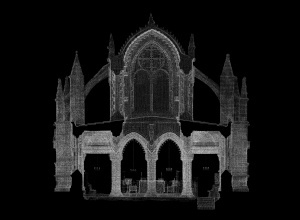 Over a billion data points were captured during the project, creating a complete 3D data set of the chapel. The project is now partnering with CyArk to provide dissemination of the data to further the chapel's educational and tourism objectives. Once the data is live on CyArk, visitors will be able to virtually visit Rosslyn Chapel and learn more about the structure and its history. The digital data set will also allow users to visualize the chapel without its current protective shelter, explore architectural elements up close and in 3D, and learn more about the construction of this interesting monument. We are very excited about our role in this project and look forward to launching the data on our site in the coming months. Preview of the Rosslyn Chapel data showing the Apprentice Pillar on the far right. Image courtesy of Historic Scotland and Glasgow School of Art.